Picks to Click contributors for the 2018 season include: John Baetz (Kansas Pregame Magazine); Hayden Barber (Wichita Eagle); Sean Boston (Sports in Kansas); Dion Clisso (PrepsKC.com); Matt Gilmore (Kpreps.com); Chet Kuplen (Sports in Kansas); Brent Maycock (Topeka Capital Journal); and Conor Nicholl (Kpreps.com). Quarterback Drew Biggs, just one of two seniors back for the Lincoln Leopards, will try to help his team improve on back-to-back 1-8 seasons this week against Wilson after the Leopards posted a 72-6 victory over Tescott in week one. The Trojans are the only team Lincoln has beaten the last two seasons. Biggs found the end zone early and often against Tescott completing his only pass for a 35-yard touchdown to Zach Obermueller to open the game and rushing 10 times for 132 yards with three scores while adding five successful two-point conversion runs as the Leopards rolled up 72 points by halftime. New coach Dustin Patee will lean on Biggs and sophomore running back Tyler Good to fuel his spread option offense as the Leopards travel to play Wilson in week two looking to double their win total from a year ago. 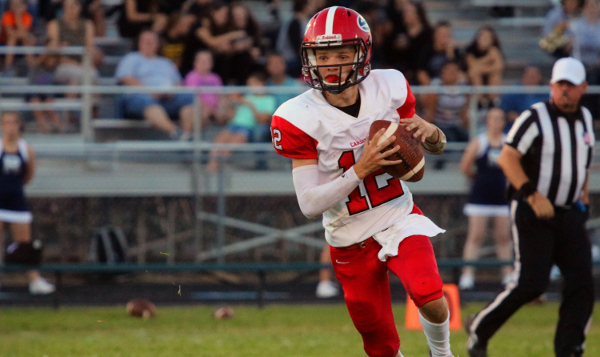 Caudle, a junior who is already in his third year as a starter, had 246 yards passing with four touchdowns, along with one on the ground last week in the 48-24 victory over McLouth. He has thrown for over 3,400 yards and 46 touchdowns in his career with nearly two full seasons left. Look for Caudle to have a big outing versus Oskaloosa. In a Central Kansas League contest, Jorge Hanschu had a breakout game in a 42-36 loss to Hesston, a preseason top-5 team in Class 3A. The senior completed 16 of 28 for 251 yards and five scores, along with 25 carries for 113 yards. Hillsboro went 1-8 last season and didn’t score more than 32 points in any game, including a 41-6 loss to Hesston. Hillsboro has not tallied more than 36 points in a contest since a 37-6 win versus Lyons on Oct. 10, 2014. The 5-foot-10, 165-pound Hanschu served as the starting running back as a sophomore, and then had to sit out last fall due to an ACL injury suffered in baseball. Hanschu, known for his running ability and vision, had multiple big plays on third-and-long and impressed Hesston coach Tyson Bauerle. Hillsboro is at struggling Lyons on Friday. The Lions have lost 21 straight contests. Kasen McKee had a huge opening night in the Blujays’ return to 11-man football as Pleasanton delivered a 42-14 victory over Northeast-Arma. McKee caught 11 passes for 230 yards and four touchdowns from his quarterback, and brother, Kaden McKee. Last season, the McKee duo helped a Pleasanton offense average nearly 45 points per game in eight-man football. Kaden passed for more than 2,000 yards, while Kasen had more than 750 receiving yards and 16 touchdowns. Pleasanton will now host Southeast-Cherokee this week in a game that was moved from Cherokee due to incomplete renovations to the Lancer’s track surrounding the football field. Led by All-Class 3A selection Elliott Strahm, Sabetha averaged 325 yards per game on the ground last year on its way to capturing the Class 3A state title. The highlight of the year was a 611-yard performance against Osage City, but the Bluejays' top game during the regular season was a 444-yard night in a 57-0 win over Riverside where they racked up eight rushing touchdowns. Four backs had at least 75 yards in Sabetha's season-opening win over Nemaha Central as the Bluejays amassed 392 yards. With rain in the forecast, Sabetha may not attempt a pass and its ground game should run wild. Sanchez and the Eagles had a big night on the ground last week in beating rival Olathe East. The senior running back had 192 yards on 18 carries while scoring 3 touchdowns. Sophomore Arland Bruce IV added 133 yards rushing and three more scores as the Eagles racked up 478 rushing yards. It could be another big week for Sanchez against a young Shawnee Mission North. The senior QB threw for 502 yards on 31-of-51 passing and two touchdowns in last Friday's win over Remington. This Sedgwick offense has been putting up crazy numbers over the last few seasons under coach Doug Mabry and currently Jeff Werner. They're a team that doesn't play in a very strong league, so this won't be the only time we see Schroeder pass for over 300 yards. Schroeder will look to have another big week when the Cardinals travel to Wichita to take on the Independent Panthers. Schroeder threw for 2,601 yards last season and 30 TD's, so look for those numbers to rise even more this season after his impressive week 1 performance. Theis is coming off a game in which he carried the ball a dozen times and ran for 212 yards in Pratt's 34-0 season-opener against Hoisington. Halstead has been a consistent program, which means Theis should get the ball at every opportunity. With that, he will have plenty of opportunities to strut his skills for a Greenbacks offense that is completely engulfed in his ability. Last year, Pratt ran for 313 yards on the Dragons in a 39-30 win.